I read this article and found it very interesting, thought it might be something for you. The article is called How To: Talk To Your Kids About Your (Late) Parents and is located at http://modernloss.com/talk-kids-late-parents/. While getting the kids in the car after yet another snowstorm this winter, I noticed my 5-year-old son kicking the chunks of slush and ice from wheel wells. I had a flash of recognition: My mother standing in our driveway doing the very same thing, a satisfied smile on her face. “My mother used to love doing that,” I told him. He looked at me with an amused, far-off expression, as if I’d just told him a funny secret. 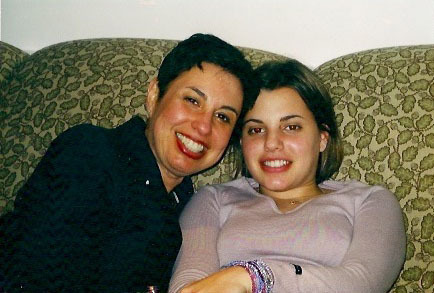 Jennifer, right, with her mother. It was such a small detail, but that was why I wanted to share it with him. My mother died when I was 22, long before I had kids. Now that my son is getting to an age where we can talk about my mother, I’ve been thinking a lot about how I can share her with him, and soon, with my 2-year-old daughter. Of course, I want them to know the facts of her life — that she was born in Sweden, the daughter of Holocaust survivors, that she came to Canada as an infant with her family and not much else — but also her habits, her quirks, the things that made her her. The truth is, I haven’t told them much, partly because I feel that no matter what I tell them, it’ll never be enough. As Adina Kay-Gross wrote in an essay for Modern Loss about sharing memories of her father with her children, “My rational side tells me that regardless of how much I talk, my girls won’t ever really know my dad. Because they won’t know ever know what his eyes looked like when he laughed or the joy of receiving a package from him at summer camp or, the comfort of calling him after school to download their day.” Still, like Kay-Gross, I feel an emotional pull to share what I can, as I’m sure many of us do. How can those of us who have lost loved ones convey who they were to our children in a way that feels meaningful and rewarding to us and to them? 1. Be realistic. Allison Gilbert, author of “Parentless Parents: How the Loss of Our Mothers and Fathers Impacts the Way We Raise Our Children,” lost her mother when she was 25 and her father five years later, when her son was 18 months old. She used to feel an “oppressive pressure,” as she puts it, to keep their memories’ alive for her son, but eventually she realized she had to recognize her limitations. “It’s impossible to give your child everything you had,” she told me , “because when you had it, that person was alive.” Acknowledging these limitations is liberating, she says, freeing you to think about what you can do to help your children get to loved ones who’ve died, a topic she explores in a book she is currently working on. 2. Involve your child. As Gilbert points out, children are inherently egocentric, especially when they’re very young; they see the world in terms of how it relates to them. Often, a memory of a loved one who died will make more sense if it somehow relates back to them. This can sometimes be as simple using words that connect the child to the deceased; for example, saying “your grandmother” instead of “my mother,” says Gilbert. She also suggests involving the child in an activity, such as decorating a picture frame and then putting a photograph of the deceased in it. Later, she says, the child can look at the frame and say, “I made that.” Kay-Gross incorporated a memory of her father into her twin daughters’ morning routine: When she gets them dressed, she pulls their pants up high and then lifts them up by the waist, just as her father used to do with her when she was little. The girls know this was something their “papa” did, and the story resonates with them, says Kay–Gross, because it’s connected to something they do every day. 4. Capitalize on technology. Kay-Gross plans to share videos of her father with her children; hearing their grandfather’s voice will be especially meaningful to them, she says. My mother died in 2000, before recording and documenting every significant moment of life was the norm, so I don’t have any audio or video recordings of her, a fact I’ve long lamented. However, Gilbert suggests we can use technology in creative ways even without recordings like these. Websites such as justfamily.com, for example, allow family members and friends to collaborate on a virtual memory book, adding their own photos and captions. It’s a way to “crowdsource memories, giving you memories you might not have had,” says Gilbert. No amount of talking and scrapbooking can ever replace the flesh-and-blood presence of my mother in my children’s lives. That’s a loss my kids and I live with every day. But if I share her with them as best I can, a small piece of her will live in them. Jennifer Richler is a freelance writer living in Bloomington, Ind. Follow her on Twitter. She recently wrote about condolence notes for Modern Loss.